This issue's cover is a photograph of Anne Frank whose diary is discussed by Michael Rosen fifty years after its first publication. Following the arrest of the Frank family and their companions, the secret annex in Amsterdam where they had been in hiding was locked up and everybody forbidden to enter it, since Jewish possessions became Nazi property and were carted away. Before this happened, the young woman, Miep Gies, who had provided those in hiding with food and who had a second key to the annex, risked herself once more by entering it. Miep retrieved Anne's diary from the devastation together with the Frank family photograph album. Thanks to Penguin Children's Books for help in reproducing this cover. Sharratt's zany black and white line drawings will instantly grab readers of this latest Wilson tale. The author mines her familiar subject - school life with errant pupils, flabbergasted teachers and off-the-wall monsters. On this occasion, Natalie is doing a class project on flying and rapidly finds herself translated to Monster Planet eating McMonster burgers. 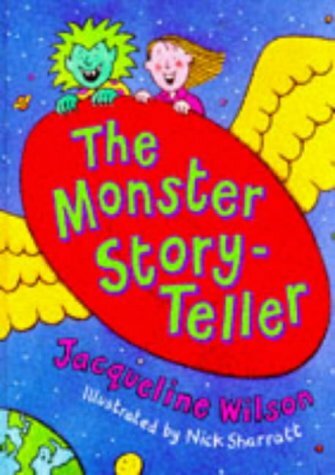 The tale unfolds pacily and wittily, with a special vistor to school on the final pages worth waiting for! Wilson knows her young audience well.